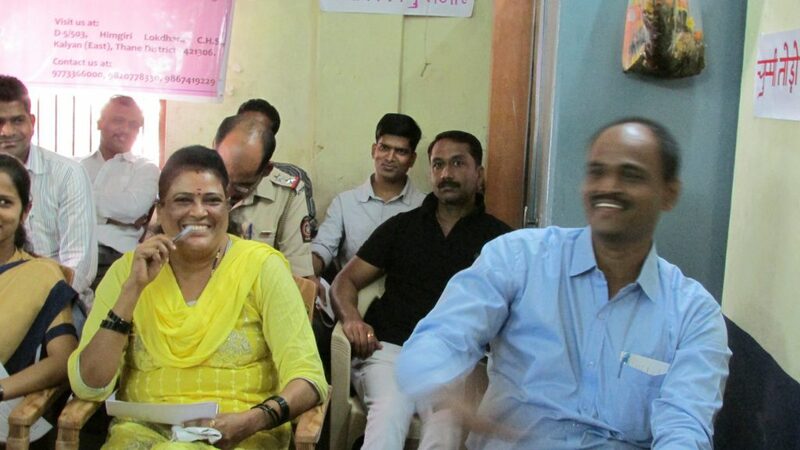 On March 3rd, 2016, Anubhuti organised a workshop on the Prevention of Sexual Harassment in the Workplace Act, 2013 with the Bandra Railway Police and Homeguards. Advocate Lakshmi took the participants through the Act, including its background and the struggle behind it, structures and procedures set in place by this law and the role of the Internal Complaints Committee, with a nuanced understanding of gender. This Act is imbedded in a history of feminist lobbying for legal clarity and penal procedure against a large and widespread area of sexual violence known as ‘sexual harassment’. As any girl or woman will say (given the sensitivity and space to be able to share such experiences), sexual harassment can happen anywhere, with anyone, by anyone, at any time, and the implications are horrific. Sexual harassment is a spectrum of sexual crimes against women and girls (and men & boys, on a much lesser scale) which is rooted in patriarchal tendencies to control, dominate and oppress through an assault on someone’s sexuality. Adolescent girls see it as one of the biggest restrictions on their expression, movements, access to education, and overall freedom – it is their first introduction to growing up and sexuality – and the experience is scarring. Most women and girls face some form of sexual harassment on a daily basis, affecting the way they access spaces, which routes they take to work or education, what time they leave the house, and such other fundamental details of life that anyone should have the right to decide for themselves. Despite such widespread occurrence and impact, sexual harassment is still trivialised by being referred to as “eve-teasing”, and it is the women and girls who experience it who are almost always blamed for it, suffering not just the actual violence of harassment, but subsequent stigma, increased restrictions from home and community, and accusations of “you must have done something to provoke the harassers”. The recent Sexual Harassment of Women at Workplace (Prevention, Prohibition and Redressal) Act, 2013, puts into law the various forms of violence that counts as sexual harassment and procedures to penalise the harasser when the harassment occurs at a workplace. It recognises that sexual harassment is a major obstacle faced by women at work, and puts the onus of dealing with it on the employer. It defines ‘sexual harassment’, ‘women’ and ‘workplace’ in the widest manner possible, bringing into its purview most public and private spaces that any woman or girl might face sexual harassment at. This workshop was an attempt to spread awareness about this pioneering Act, which many people are not aware of, leading to ineffective implementation. The potential of this Act to create a healthy work environment for everyone was emphasised, and the participants being the railway police, it was detailed how they are in a position to make widespread use of it – to deal with any sexual harassment faced by all women and girls at the railway station and trains, and not just faced by women employees. Many of the participants were unaware of actual provisions of the Act, and said they felt empowered after learning of it, since they felt it would give them the legal backing to deal with cases of sexual harassment and show support to women and girls facing it. It was a fantastic session, followed by intense discussions and sharing from the participants. This workshop is another step towards engaging with stakeholders of democracy and social justice – so that they form support systems for change towards a more equitable and just society.